4/16/2019Why is Aaron Nola struggling so much? 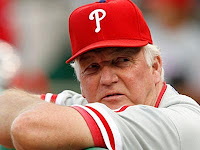 PBR - Questioning Charlie Manuel's in-game decision making is a pastime of sorts for many Phillies fans and sport-talk pundits, but there actually is a metric to quantify the value of a managerial decision or important play. Win Probability is an advanced metric that can either strengthen or debunk a given argument about how a managerial decision influences a ballgame. The metric can also mathematically identify specific plays in a game and place weighted values on those that significantly impact the final outcome. The concept of Win Probability is actually pretty straightforward. At any given time within a contest both clubs have a certain probability of winning. 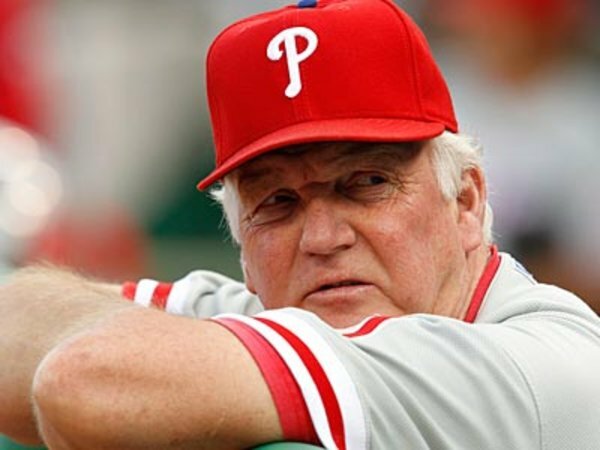 For example, let's say the Phillies have a three-run lead entering the bottom of the sixth inning, their chances of winning the game are significantly higher than if they were leading by four runs in the bottom of the second. Win Probability fluctuates with every play and is highly dependent on the score, inning, number of outs and placement of base runners. Several matrices exist but a quick and easy one to use can be found on Greg Stoll's Web page [link]. Here's an example: Bottom of the eighth, score tied, runner on first, no one out. The home team has a 70% chance of winning according to Stoll's Win Probability calculator. Let's say the batter drops a sacrifice bunt to advance the runner to second. Turns out the Win Probability actually decreases to 69%, so the sacrifice was a neutral event. To demonstrate Win Probability I went ahead and charted Sunday's Phillies Nationals game. The graph below shows how the probability of a Phillies victory fluctuated throughout the contest. I went ahead and marked the two events that significantly enhanced the Phillies' odds of winning. Taking Win Probability a step further, another metric exists called Win Probability Added (WPA). This metric is calculated for every player in a given game and assigns a numerical value to how their contributions helped or hurt his team. Say, for example, a player comes to the plate in the top of the sixth with his team trailing by a pair of runs with one out and runners on second and third. Putting this situation into Stoll's calculator we can see the visiting team has a Win Probability of 0.369 (37%). If the player at bat hits a single the game situation changes - the deficit is trimmed to one run and runners are now at first and third, so the Win Probability has increased to 0.396 (40%). Keeping track of WPA, you credit the batter +.027 and debit the pitcher (fielder if an error is committed) -.027. If calculated for every play in a game the total WPA for the winning team should be .5 and the losing team -.5. You can then see how various players performed and see who did the most to help/hurt his club. Win Probability and Win Probability Added are metrics I often refer to when analyzing player performance and managerial strategy. Moving forward, these metrics will become more intertwined in our articles. - Patrick Gordon is the editor of the Philadelphia Baseball Review. Contact him at pgordon@philadelphiabaseballreview.com or @Philabaseball on Twitter.